When Bob Ouellette first read about an opening in the Thos. Moser workshop, he applied immediately and wouldn’t take no for an answer. As a young man, Bob had already decided to pursue his passion for working with his hands. The opportunity to build finely crafted furniture appealed to Bob’s strong sense of pride. Bob has now been with the company for well over twenty years and has the furniture collection at home to prove it. 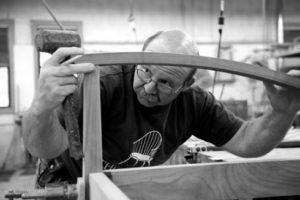 Bob is a familiar face for many customers, primarily because he has traveled to most of the showrooms and other events doing chair making demonstrations. He has built everything from a Sleigh Bed for his wife to a Slant Top Desk and a Child’s Continuous Arm Chair for his youngest daughter when she was eight. Since his children have grown, he has taken to building furniture for other milestones, most recently a Vita Bed for his daughter on her wedding day. The Thos. Moser Continuous Arm Rocker holds a special place in the heart of master Thos. Moser cabinetmaker, Bob Ouellette. “Thos. Moser furniture plays a large role in our family traditions. Especially the Continuous Arm Rocker – it was one of the first pieces I made at Thos. Moser when I arrived more than 25 years ago. There is a lot of craftsmanship in the chair you don’t see – from the pommel of the seat to the design each layer of the tree makes and circular patterns it creates giving it a distinct look. And the contrast of the cherry seat with the ash wedges and spindles is really eye appealing – you just can’t help but touch it. Besides woodworking, Bob’s other passion is gardening. He grows everything from garlic to gourmet veggies, harvests fiddleheads and makes maple syrup in the spring. He is sought out by local high-end restaurants and markets, who repeatedly purchase his organic produce. It’s not uncommon for Bob to bring samples into the shop and customers who have met him are always interested in learning what he is growing now.